Darlene Dallice (Carter) Ogilvie, 60, of Petitcodiac passed away at The Moncton Hospital on Friday, March 15, 2019. Born in Fredericton, she was the daughter of Margaret Parker and the late Lawrence Carter, and beloved wife of David Ogilvie. Darlene was a homemaker who loved being with her family. 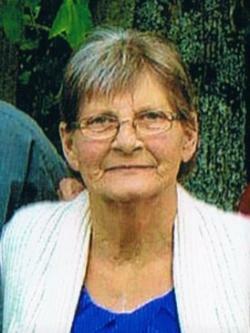 She enjoyed watching her children and grandchildren in their sports, and liked to play bingo. She was a traveller, joining in several cruise destinations with her girlfriends. Darlene’s door was always open to friends and family alike. In addition to her husband, she is survived and sadly missed by her daughter, Kimberly Ogilvie (Al Dowling); sons, Rodney Ogilvie and Jamie (Krista) Ogilvie; grandchildren, Shania, Shaun, Carter, Daytona, Kyra, Haylee, Emerson, Beau; great-grandchild, Levitt, all of Petitcodiac; sister, Gayle (Rodney) Tingley of Middlesex; brother, Lawrence (Lucille) Carter or Turtle Creek; many nieces and nephews. Besides her father, Darlene was predeceased by her mother and father-in-law, Fleming and Evelyn Ogilvie. Resting at Salisbury Funeral Home, 3350 Route 106 (372-4800) from where visiting will be held on Tuesday, March 19, 2019 from 6 – 8 pm. There will be no Funeral Service as per Darlene’s request. Interment in Maplewood Cemetery in the spring. If desired, memorials to the Heart and Stroke Foundation or Juvenile Arthritis Foundation would be appreciated.